wanderlust ATLANTA: Atlanta's Spectacular "Chihuly in the Garden"
Atlanta's Spectacular "Chihuly in the Garden"
Part of its 40th anniversary celebration, the Atlanta Botanical Garden is home of a spectacular "Chihuly in the Garden" exhibition. This exhibition features 19 installations, three created just for this exhibition. The above installation, Fire Amber Herons, is my personal favorite. It's located in the Ferst Fountain, where you will discover Lily, Lottie and Luna behind a waterfall, in the Perennial Garden. 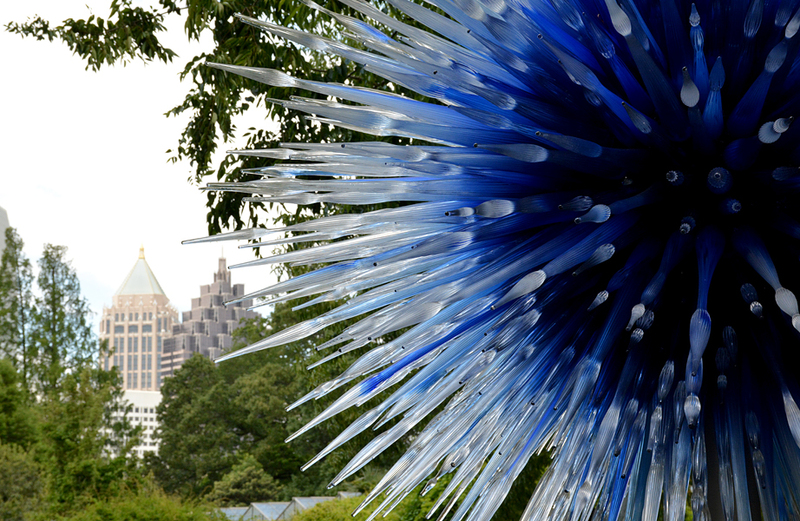 A mere two years after President & CEO—and visionary—Mary Pat Matheson assumed leadership of the Atlanta Botanical Garden, she again put the Garden "on the map" with a Chihuly exhibition in 2004 that increased visitorship to record levels. She's continued to do so since. Did you know that the Japanese Garden in the Atlanta Botanical Garden pre-dates its 1976 founding? Go on a guided tour of the Garden and you'll learn lots of fascinating facts and factoids about our "Oasis in the City". The two immediately above photos are Turquoise Marlins and Floats, featured in the Japanese Garden. 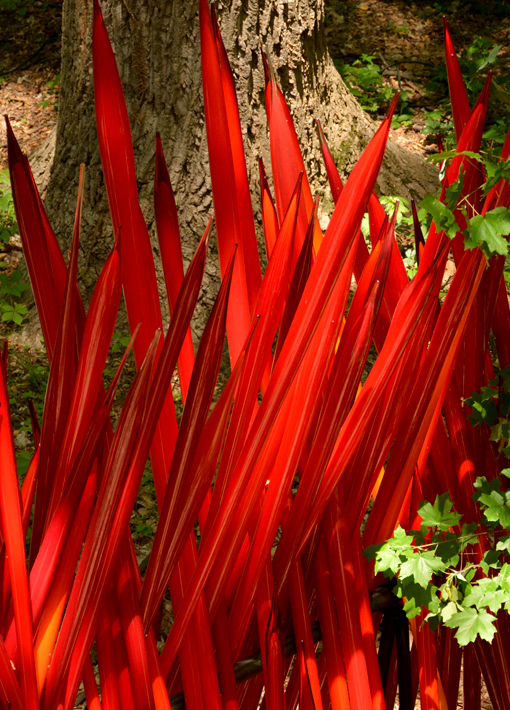 Located in The Gardens in Storza Woods, opened only in recent years, you'll discover three groupings of Red Reeds. Red is my favorite color, so I found these particularly magnificent. They're strategically placed, so you may or may not see them as you come upon them, but you'll definitely see them! Sapphire Star, in Howell Fountain at the end of the Crepe Myrtle Allée and the top of the Great Lawn, is magnificent! You can't miss it and you won't be able to resist taking a photo of or with it. Immediately under the Canopy Walk (which opened only in 2010) is Green Hornets and Waterdrops. 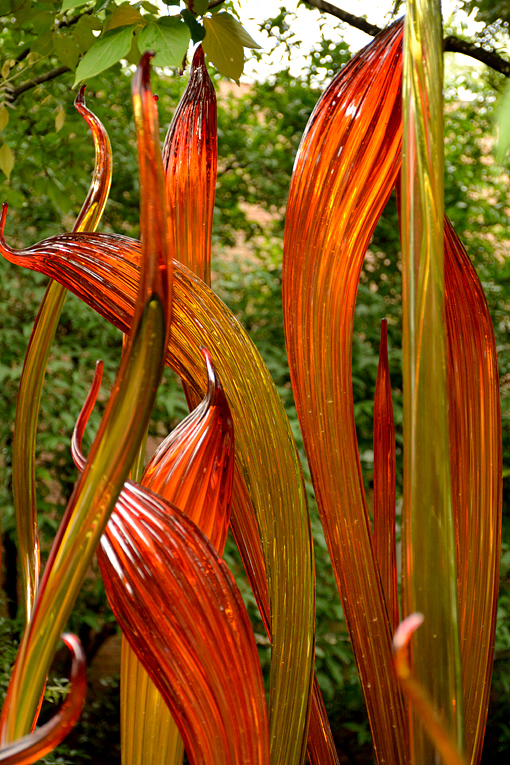 Its backdrop is another favorite...several "plantings" of Neodymium Reeds, the purple "stalks" that the sun makes sparkle during daytime and strategic lighting makes spectacular in the evening. 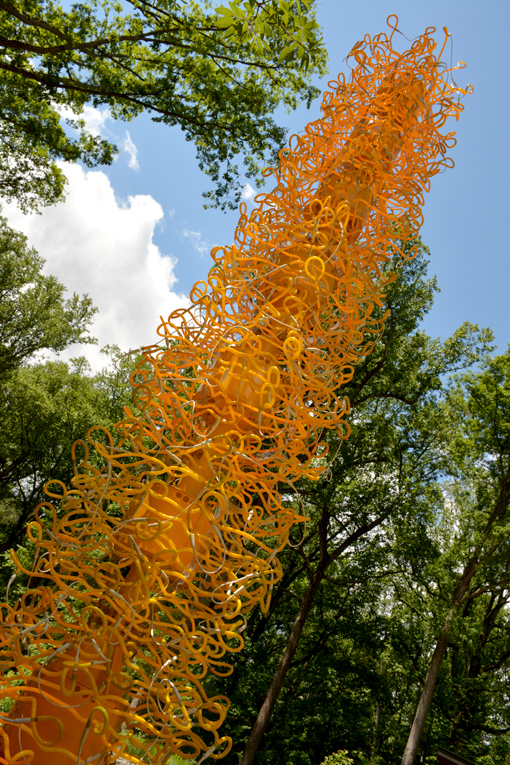 At the top of the relatively new Water Mirror in Storza Woods is the 30-foot tall Saffron Tower. I'm not convinced if it's more spectacular during the day or when fully illuminated—all its neon tubes—in the evening! 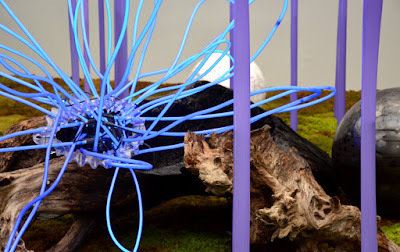 In the lobby of the Fuqua Orchid Center you'll be mesmerized by Sapphire Neon with Neodymium Reeds, Floats, and Logs. 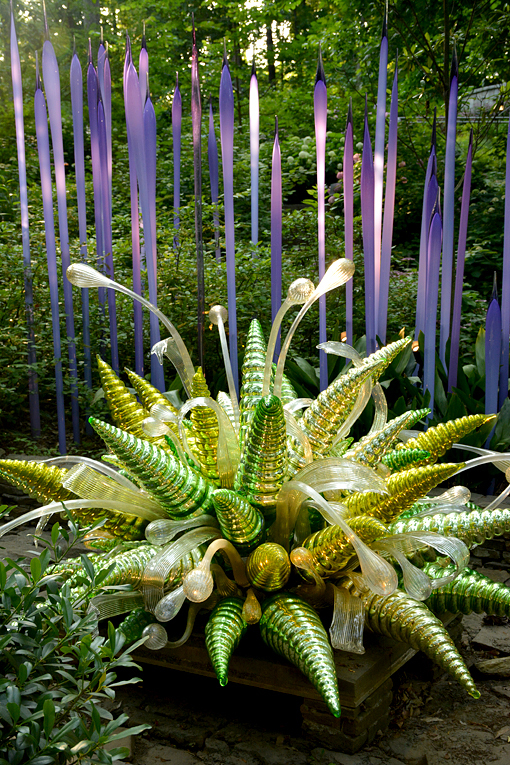 This installation features multiple techniques used by artist Dale Chihuly, set among natural elements. I've seen this exhibition many times now, with friends Barry, Jacquetta, Luc and Saffold, all on separate visits, and the one installation that has grown on me the most is the Black and Green Striped Herons with Icicle Clusters, displayed in the Fuqua Orchid Center. It's truly magnificent and a favorite backdrop for visitor photos, group and individual. Lining both sides of the Great Lawn, in front of the Fuqua Conservatory, you'll see the splendid and spectacular Carmel and Red Fiori. 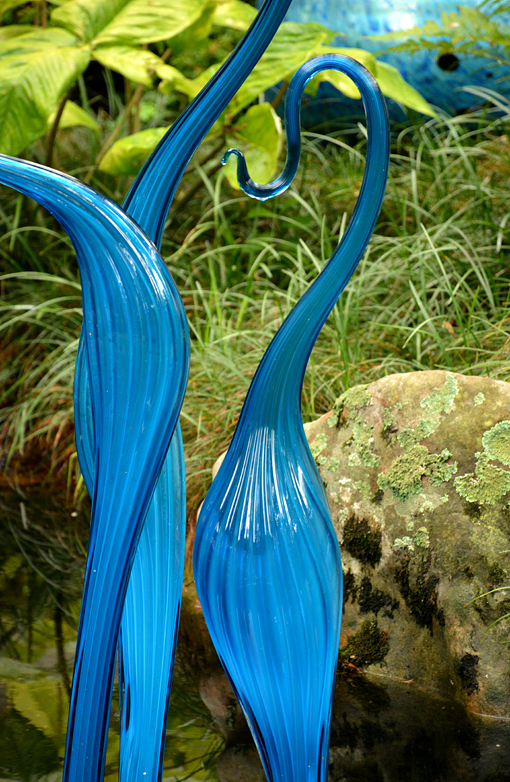 I love the movement of Chihuly's work...you can't help but be moved by it. 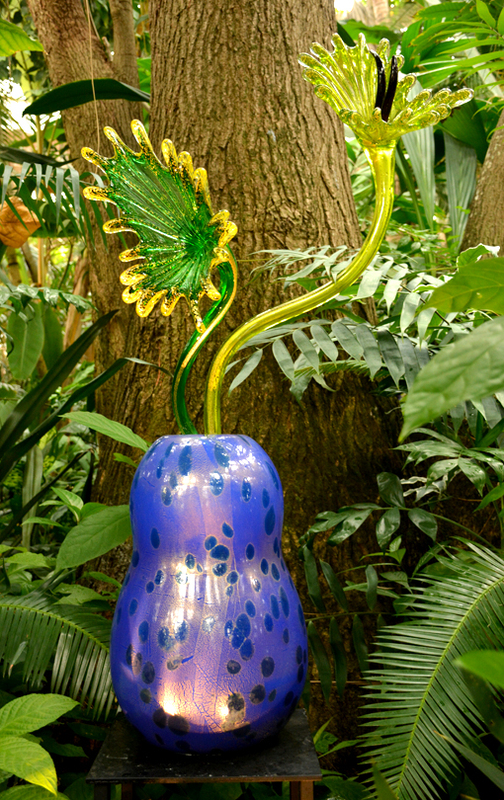 The above, Ikebana, is located in the Tropical Rotunda in the Fuqua Conservatory. 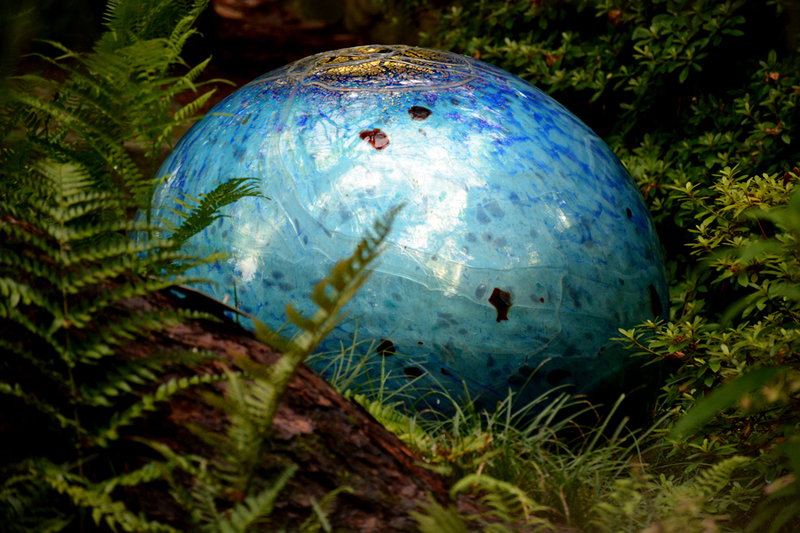 Be sure to look around when in the Conservatory...there are multiple sculptures here, each unique and splendid. Want a video sneak peek? 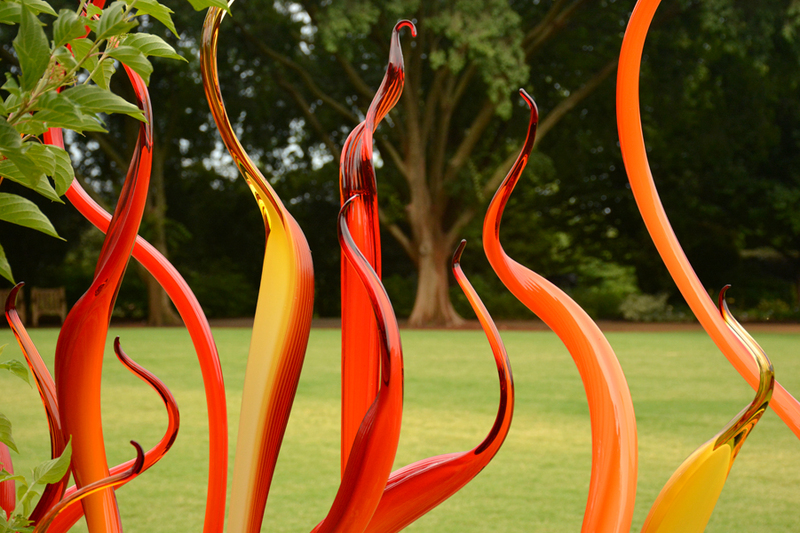 Check out this video featuring Dale Chihuly himself exploring Chihuly in the Garden at the Atlanta Botanical Garden. This 40th anniversary exhibition will be on display through October 30, 2016. See it and be mesmerized! Then see it at night...see Chihuly Nights! 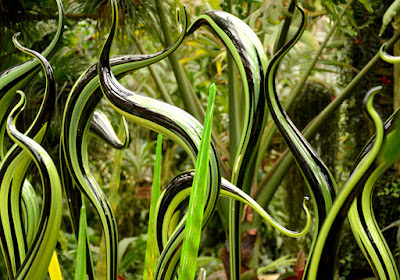 I love Dale Chihuly's work. So beautiful.